Any discussion about the Hart Trophy and determining who is the NHL’s most valuable player is going to include arguments based on timing. Pittsburgh’s Sidney Crosby was the runaway favorite for the award at the season’s midpoint as the most dominant player en route to a potentially historic campaign. A concussion derailed his chances, though he may still end up in the top 10 of the voting despite missing half the season. Tampa Bay’s Steven Stamkos assumed the frontrunner position as Crosby’s absence continued, but eventually his goal-scoring prowess -- what had pushed him to the top -- also went missing. Stamkos’ final totals (45 goals, 91 points) are splendid, but a League MVP candidate at forward needs to score more than 7 goals in the final 31 games of the season. This MVP race is likely to boil down to two candidates -- Anaheim’s Corey Perry and Vancouver’s Daniel Sedin. Again, it is about timing -- did Perry’s crazy scoring spree in the final weeks do enough to surpass Sedin, the guy who had the most consistent season of the contenders? Daniel Sedin, Vancouver Canucks: Sedin finished the season with 104 points -- six more than Perry but eight less than what his twin brother Henrik had a season ago when he collected the Hart Trophy. There is also the issue of Ryan Kesler, who some pundits feel might be Vancouver’s MVP. Again, back to the timing -- while Perry piled up numbers down the stretch to help his team into the playoffs, Sedin piled up numbers consistently while his team dominated the League and was comfortably in a postseason position before Perry even got started. Both Perry and Sedin had at least 10 game-winning goals, but should Perry be rewarded for having five of them come in the final month? Sedin also had a League-high 12 first goals and Vancouver was an NHL-best 41-2-6 when scoring first. Sedin doesn’t deserve it because he was the best player on the best team -- he deserves it because he was the best player over the course of the entire season. 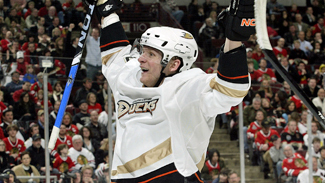 Corey Perry, Anaheim Ducks: Perry woke up on March 6 with 31 goals, or one fewer than Crosby had in exactly two months less of work. He then proceeded to go on an incredible tear -- 19 goals in 14 games. He finished with five more than Stamkos and nine more than Sedin. While Sedin could lose some votes because of Kesler (and his brother), Perry also had Teemu Selanne on his team. Selanne was nearly as important to Anaheim, scoring 10 goals in 10 games as the Ducks solidified their spot. That Anaheim climbed all the way to fourth instead of seventh or eighth will probably aid Perry’s cause and the difference between he and Sedin could be very little. Martin St. Louis, Tampa Bay Lightning: This spot could be a similar argument to the top two guys. St. Louis was Mr. Consistency for a Lightning team that desperately needed it, while Calgary’s Jarome Iginla scored 18 goals in the same timeframe that Perry had 19 and nearly willed his team from as far back as 14th in the West to the playoffs. St. Louis had at least 10 points in each of the first six months, including 17 in March when his partner Stamkos was struggling. He found ways to produce besides just feeing Stamkos for one-timers, and kept Tampa Bay from slipping into a fight for playoff berth. There are a few goalies who could be in the conversation for the Hart, and maybe Stamkos or Kesler could be there. Regardless, the award will come down to Daniel Sedin’s consistent production against Perry’s amazing finish.